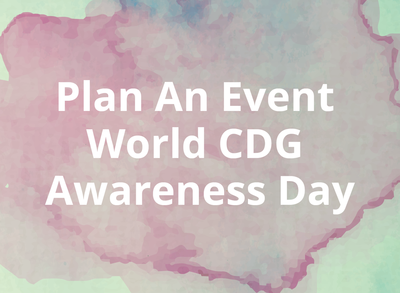 Are you planning or do you want to plan an event to support 16th May as the annual World Congenital Disorders of Glycosylation (CDG) Awareness Day? 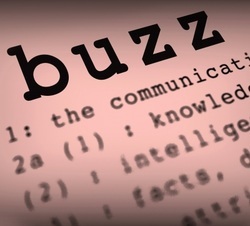 We can help you communicating and disseminating your event, or we can give ideas to set up an activity. Fiona Waddell represents CDG within ﻿VKS﻿, the Dutch Umbrella organization for metabolic diseases. When she was fifteen years old Fiona was diagnosed with MPI-CDG. She was the second patient in the world who was diagnosed with this illness. Fiona was the first CDG patient who has had a liver transplant and due to the liver transplant, now she can lead a healthy life . She is journalist and our current major goal is to boost awareness for CDG community by (1) representing CDG within major leading Rare disease events, (2) volunteering in the production of many resources for CDG and (3) being responsible for media and communication resources for the 3rd World Conference on CDG 2017. Read more about Fiona at the Rare Commons interview "CDG patient Fiona hopes to create greater CDG awareness by using her journalistic skills"
"CDG is the prototype of condition that cries out for urgent visibility and awareness-raising actions", emphasizes Alfredo Ferreira, father to a CDG patient. REMEMBER, the materials may not be used for commercial or fundraising purposes. 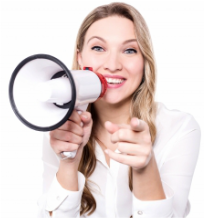 Advocating for CDG to government leaders: we really want to encourage everyone in our patient community to email, mail a letter or call their elected officials to address some concerns of our rare disease community. Soon we will have a template letter for this purpose. In Portugal, Correio do Cidadão is an easy system for you to email a letter on issues that concern you to your elected parliamentary groups and to the Republic Assembly president for Rare Disease Day. 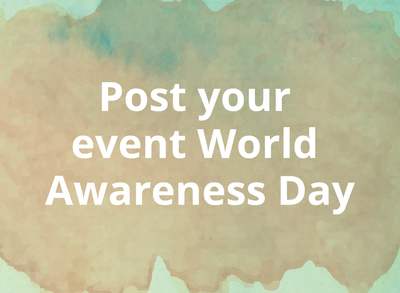 In USA, Rare Disease Legislative Associates (RDLA) and Congress web have an excellent system for you to email a letter on issues that concern you to your elected officials for Rare Disease Day. The Global Genes Project has a print and online collaborative resource that educates patient community on how to bring rare disease to capitol hill. "Society needs to know that Congenital Disorders of Glycosylation (CDG) is a serious cause of death and disability. Patients and family members, suffer directly the consequences of living with a disease, for which the most forms do not have a cure", highlights Rosália Félix, mother to Princess Liliana (Portugal). 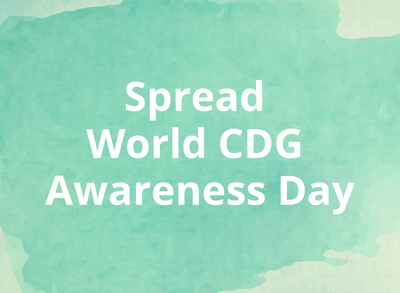 Symbol "16th May as the annual World Congenital Disorders of Glycosylation (CDG) Awareness Day"
The most common type of CDG , named PMM2-CDG, affects about one in 20,000 people. So far, only around 900 patients have been accurately identified with PMM2-CDG. This suggests that many CDGs cases are under-or misdiagnosed than what is documented. 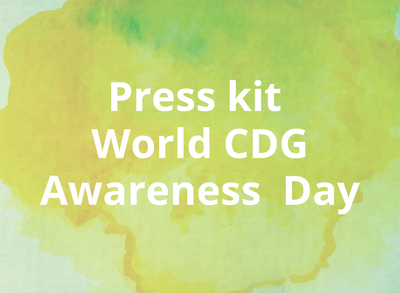 Many CDG patients and their family members wait a long time until their condition is diagnosed, partly because many clinicians do not recognise the conditions and do not interpret the symptoms correctly. The close family and friends of a CDG patient, who are wonderfully supportive, most probably are not able to name what our beloved CDG patients have, or how it functions in their body. 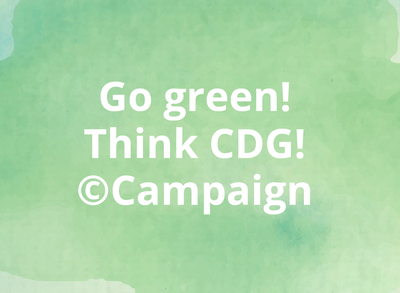 The probability to find a health care provider that knows what is CDG is extremely low. Most forms of CDG do not have a treatment. Thus, quality of life and survival of CDG patients depend on research and funding. 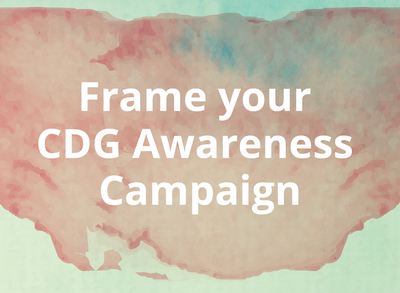 Given the scarce research funding currently available for rare diseases, diseases with lack of awareness such as CDG, represents a particular challenge for researchers working in this area. The research, the funding, and hopefully, the cures will come, but not if CDG remain unknown amongst the society! 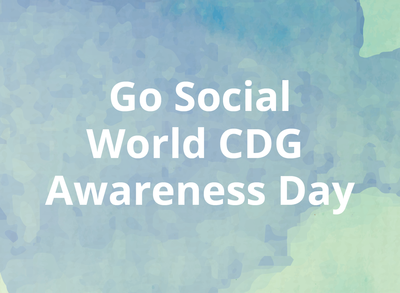 A World Congenital Disorders of Glycosylation (CDG) Awareness Day is urgently needed it! 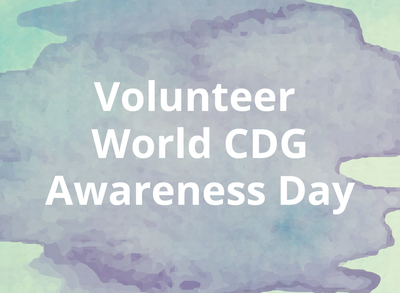 16th May, the day of birth of Pf Jaak Jaeken, is the proposed day for the World Congenital Disorders of Glycosylation (CDG) Awareness Day. WE CAN MAKE A DIFFERENCE! YOU CAN MAKE A DIFFERENCE! 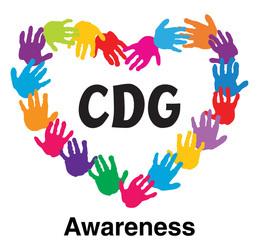 The necessary documentation for CDG patient advocacy groups, their representatives, families, friends and professionals to support this public petition is found at http://www.apcdg.com/world-cdg-awareness-day.html . Please read the manifesto and use the communication material publicly available for this purpose.